In order to assess Ground penetrating radar (GPR) for imaging the shallow subsurface geometry and characteristics of the fault in Yushu area, details GPR measurements with 25 MHz, 100 MHz and 250 MHz frequencies antenna were firstly conducted in four sites along the Yushu fault after geomorphologic and geological investigation. The 25 MHz profiles delineated an excellent general view of deformation zones at a much wider area and greater depth. While the 100 MHz and 250 MHz data provided more detailed analysis of the shallow subsurface deformation about the geologic structure and the fault, including the stratigraphic structures, the dip angle and direction of the fault plane. The remarkable variation in the pattern and relative amplitude of electromagnetic waveform on the two-dimensional GPR profiles are all obvious and it is considered as the main fault zone with a nearly vertical fault with the dip angle of 70°–85°. High frequency GPR profiles show a good consistency with the trench sections at three sites. The geometry of the main fault zone can be depicted and deduced up to ~ 12 m deep or even deeper on the 25 MHz GPR profile in Yushu area and it is considered to be the result of the movement of active faults. 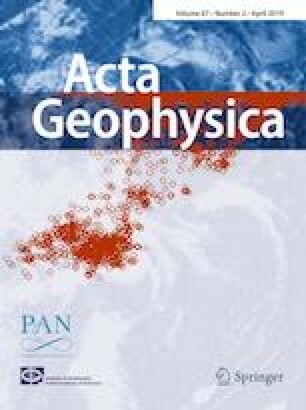 What’s more, the geophysical features on GPR profile associated to the strike-slip fault are further summarized in different geological and geomorphological environment in Yushu area, the study also provides further evidence that GPR is valuable for fault investigation and palaeoseismic study in the Qinghai-Tibet Plateau area. This work was partially funded by the work of Chinese Geological Survey (Nos. 12120114002101, DD20160268), the Science and Technique Foundation of Henan Province (No. 182102310001, 192102310001), the Key scientific research Foundation of the university in Henan Province (No. 19A420007), Doctoral Fund of the Henan University of Engineering (No. 2016004), the National Natural Science Foundation of China (No. U1704124).